Four feasible story lines have been developed in this study. Each story line shows a different direction for the development of governance for climate policy implementation and leads to core options for policy instrumentation such as instrument Building Blocks. The baseline for all story lines and scenario development that has been applied in this study involves the condition that each scenario could reach the 2 degrees target of climate stabilization. The first option has a technology specific focus, called the Planning Federation. It involves instruments that stimulate or force specific technologies and products into the market. The second option is the Liberal Market Federation. This option leaves technologies more open, with stronger generic incentives in a market structure, by encompassing emission pricing. The third option is called the Mixed System. In this scenario different levels of policy and instrumentation are accepted. The major initiatives are coming from the member state level and the EU has a core coordinating role to align the national policies within an overall EU framework. It is the Mixed System we are mainly in now. The fourth option builds on a Re-Nationalized EU in which the development of climate policies is mainly pursued at the national level, while the EU has the role of a coordinator. The story lines that have been developed within the scope of this study should be regarded as scenarios that indicate possible directions for development. Each option has its strengths and weaknesses but are not blueprints. However, the governance storylines have been developed in a way that their probability is well above zero and they can be regarded as a powerful tool to develop options for policy instrumentation. Because of this, they are highly relevant when bringing climate policy instruments in the domain of governance discussion. Huppes, Gjalt; Huele, Ruben. 2014. 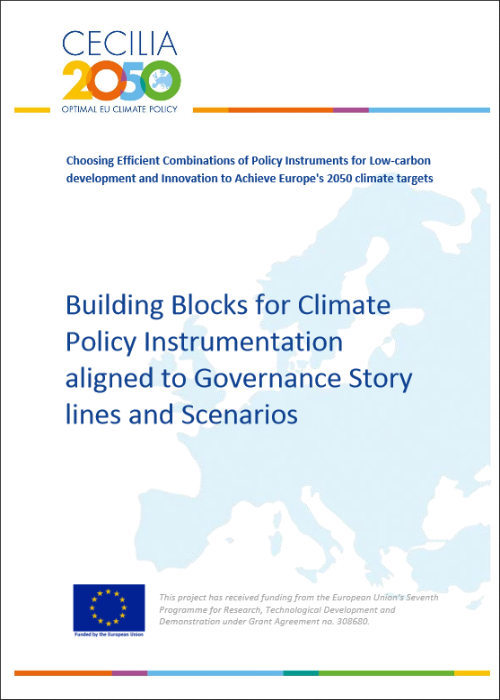 Building Blocks for Climate Policy Instrumentation aligned to Governance Story lines and Scenarios. CECILIA2050 WP3 Deliverable 3.5. Leiden: Institute of Environmental Sciences (CML), Leiden University. Sectoral Policy on Road Transport: Why and How?